For The Blue House, Mauricio Corbalán and Pio Torroja of the Argentinean architectural collective M7red developed ‘Chattheatre’, an international conversation on public spaces trough the most recent political and urban topics. Early sessions with participants from all over the world adjusted topics line citizenship, immigration, integration politics and the role of new media in public space. 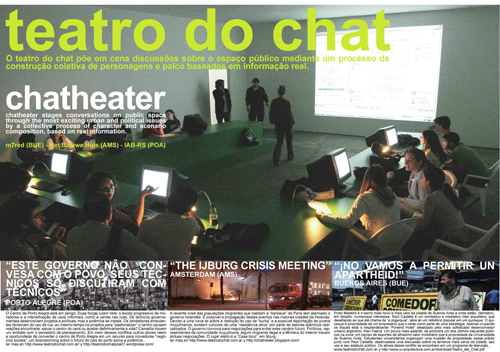 After several sessions in and from The Blue House they presented ‘Chattheatre’ at the Biennale of Porto Alegre in 2007. They are continuing to develop the ‘Chattheatre’ software and model and setting it up more permanent in Porto Alegre as one of the so-called Blue Point. For ‘GuestWelcome’ they wrote an article on value and alternative forms of trade. Two urban simulations on real time. Chatheater stages conversations on public space through the most exciting urban and political issues. The first session focused on the post crisis Buenos Aires and its new urban social actors an their strategies in the public arena. This next session will be dedicated to the latest discussion on citizenship, immigration and integration policies in The Netherlands and how it has been increasingly influenced by the new media such as bloggers. Are these media devices new actors or characters in the public space? The session will be divided in two parts. In the first one, a blog on the issue will be collectively developed by chat conversations. In the second, this scenario informed by the blog will be played as a simulation in a chat channel by actors based in Ijburg and assessed by participants in Buenos Aires. Chatheater is hosted by "Het Blauwe Huis" a project by Jeanne van Heeswijk and Herve Paraponaris. and it's based at IJburg, Amsterdam, The Netherlands.